Each weapon is individually hand crafted by some of the best arms crafters in Europe. They are able to study in depth original pieces from museums and private collections in Europe. Old-World craftsmanship ensures attention to detail. Each piece is fully functional and battle ready and they will perform just as well as the originals. Extreme care should always be taken. Each comes with the option of purchasing with or without the pole. Some assembly may be required. Functional Boar Spear is hand forged from steel, wooden pole available. Approximately 77" Overall length. The Functional Lance with side wings is hand forged from steel, wooden pole available. Approximately 78 in Overall length. Our Functional Italian Runka from 1550 is hand forged from steel, wooden pole available. Approximately 77" Overall length. Glaive with Functional Spear Head is hand forged from steel, wooden pole available. Functional Glaive is hand forged from steel, wooden pole available. Approximately 77" Overall length. The Goedendag Medieval Spear is a typical Flemish weapon, which is nothing else but a sturdy, chest length wooden staff, slightly thicker at the top, on which an iron pin is fastened, fixed with an iron ring. 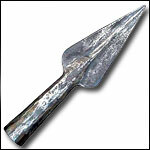 Functional Trident Spear Head is hand forged from steel, wooden pole available. Approximately 77" Overall length. Functional Renaissance Lance is hand forged from steel with wooden pole. Approximately 77" Overall length. Our Renaissance Glaive with Functional Spear Head is hand forged from steel, wooden pole available. Approximately 78" Overall length. Our Glaive has a Functional Spear Head which is hand forged from steel, wooden pole available. Approximately 77" Overall length. Functional Spear Head. Hand forged from carbon steel, with a rough hammered finish. This spear has new options for either a sharpened, blunted or reinforced safety tip for re-enactment use. Functional Spear Head hand forged from carbon steel, with rough hammered finish. New options sharpened, blunted or reinforced safety tip for re-enactment use. 19 1/2in long, 2 1/4in wide. The weight is approximately 2 lbs.